This Beef Stew in Red Wine is hearty, rich and delicious. Beef chuck simmers in red wine and vegetables until melt in your mouth fork tender! This homemade beef stew is the best comfort food meal! Instructions to make this Homemade Beef Stew in the crock pot and in the oven are provided below! 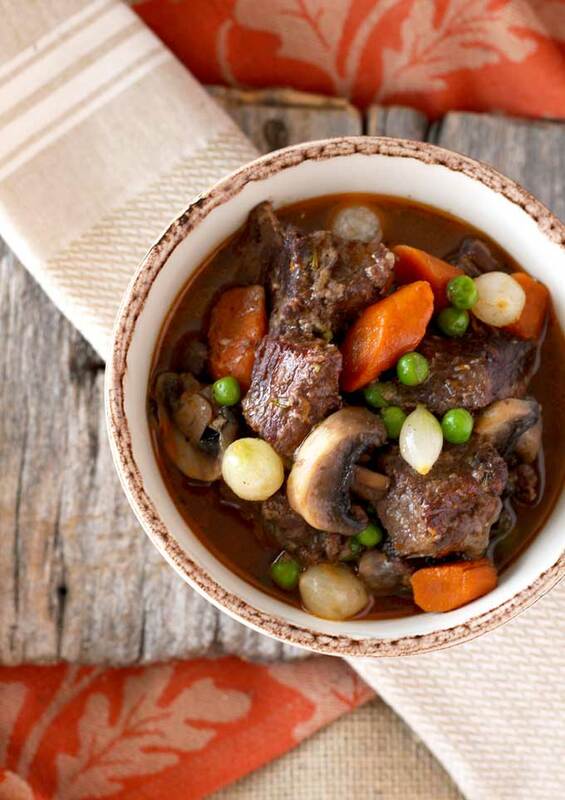 This easy Beef Stew in Red Wine (also known as beef bourguignon) is one of our favorite meals. The combination of tender meat, hearty vegetables and fresh herbs in thick and tasty gravy is what comfort food is all about. 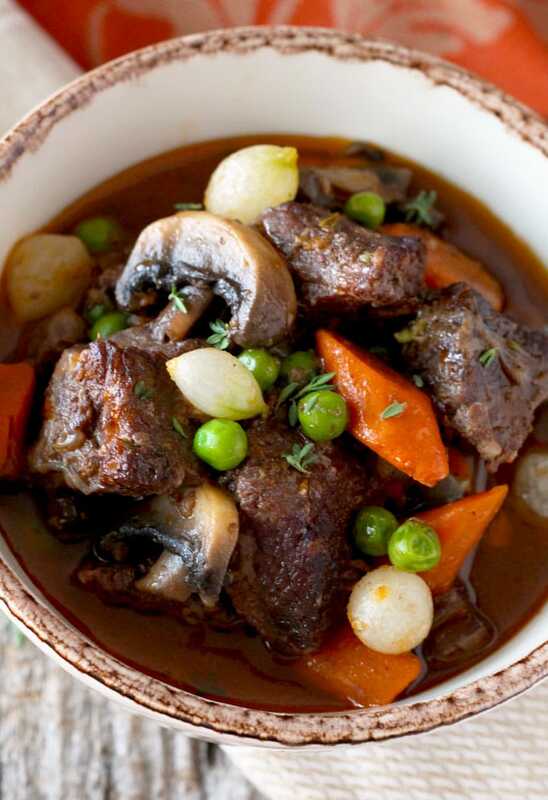 This beef stew recipe is one you will make over and over again. To make the best beef stew it is important to brown the beef. Do not skip this step. A good stew is made by building layers of flavor. 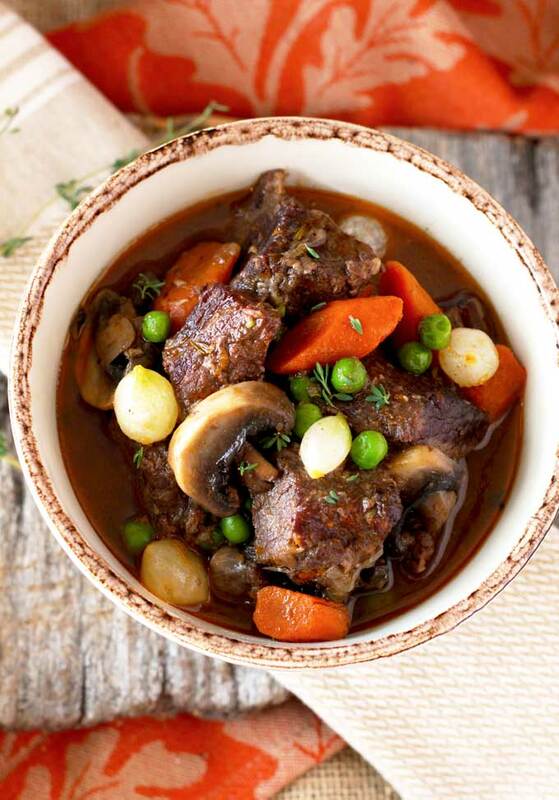 For this easy beef stew in red wine I use beef chuck that I cut up into 1-inch cubes. Pat dry the meat before seasoning it and dredging in flour. This will ensure a nice golden crust. 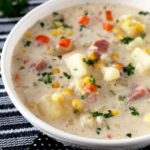 I use a Dutch oven for this stew recipe. You can use any heavy bottom pot that is oven safe. Brown the meat in batches to prevent over crowding the pot. 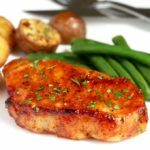 You want to get a good sear instead of steaming the meat! In the same pot, saute the onions, carrots and garlic. Deglaze the pot by adding the wine and scraping the brown bits from the bottom of the pot with a wooden spoon. Add the tomato paste and mix to combine. Return the beef to the pot and all its collected juices. Add the broth and herbs. Transfer the pot to the oven and cook for about an hour or until the beef is tender. I like to brown the mushrooms in butter before adding it to the stew. The mushrooms absorb so much of the buttery goodness that I don’t mind this simple step at all! If you are not using mushrooms, you can skip this step. 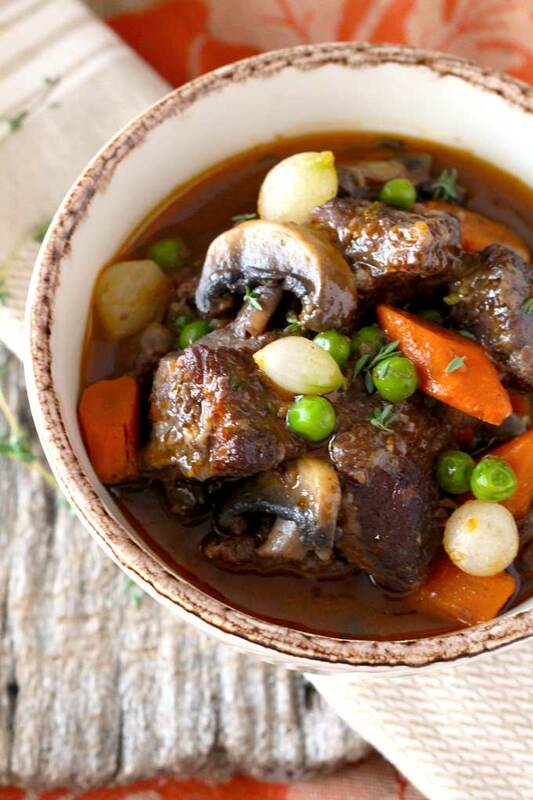 Remove the stew from the oven and add the mushrooms, peas and onions and cook in the oven for another 15 minutes. 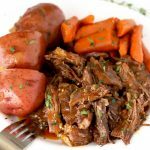 When cooking the beef stew in the slow cooker you must brown your beef and vegetables before adding them to the crock pot. You can use a cast iron skillet to get a good sear on the beef. I like to deglaze the pot/skillet where the beef was seared with wine to take advantage of all the flavor built up at the bottom. 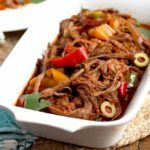 Transfer the beef, vegetables and wine to the crock pot and cook on low for 6 to 7 hours, adding the mushrooms and onions one hour before the stew is done. This Beef Stew in Red Wine is the perfect make ahead meal. 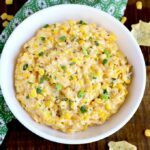 You can make it and save it in the refrigerator for 1-2 days. It also freezes well. Just thaw it in the refrigerator overnight. I love serving this delicious homemade beef stew over creamy polenta, over noodles or with some crusty French bread to soak up all the delicious gravy! Use any any red wine you would drink (because most likely, if you are like me – you will drink the left over wine!) Pinot Noir, Merlot, Cabernet or any red blend are good options. You can use this Slow Cooker Beef Bone Broth in this recipe. Take a look at these delicious stews! 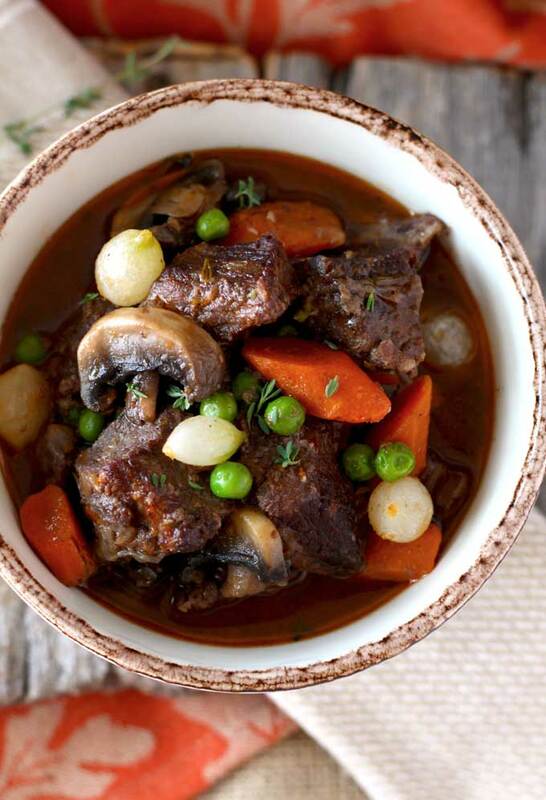 WANT TO TRY THIS BEEF STEW IN RED WINE? PIN IT TO YOUR DINNER OR BEEF BOARD!! This Beef Stew in Red Wine is hearty, rich and delicious. Beef chuck simmers in red wine and vegetables until melt in your mouth fork tender! 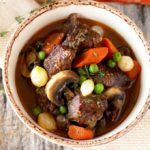 This homemade beef stew is the best comfort food meal! Instructions to make this Homemade Beef Stew in the crock pot and in the oven are provided. Dry the beef cubes with paper towels and season with salt, pepper and garlic powder. Toss the beef with the flour (do not flour the beef until you are ready to brown it). 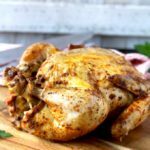 Coat a large, wide pan or Dutch oven with olive oil and bring to medium-high heat. Add the flour-coated beef to the hot pan in batches and in a single layer making sure you do not over crowd the pot. Sear on all sides until the beef turns golden brown. Remove the seared beef to a plate and continue searing until all the beef is browned. Set aside. Add more oil to the pan or Dutch oven if needed. Add the onions and carrots and sauté for about 5-7 minutes or until the onions become translucent. Add the garlic and sauté for another 1 - 2 minutes. Add the red wine and bring to a boil scrapping the bottom of the pan to release the brown bits. Cook on medium high heat for about 5 minutes. Add the tomato paste and mix well. Return the beef to the pot with all the collected juices. Add the broth (enough to cover the meat). Add the thyme sprigs and bay leaves. Bring to a simmer and cover the pot. 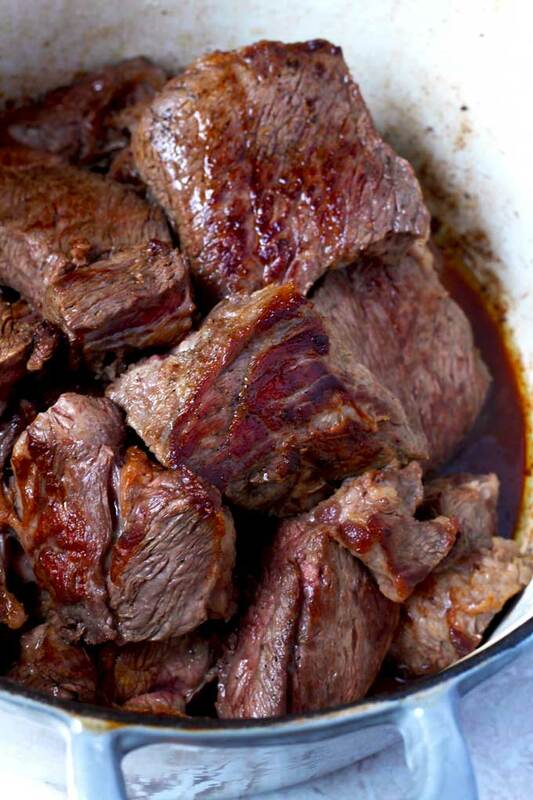 Place the pot in the oven and cook for about 1 hour or until the beef is tender when pierced with a fork. Remove from the oven. In a medium sauté pan over medium heat, melt the butter. Add the mushrooms and sauté for about 8 minutes or until the mushrooms are lightly brown. Remove from the heat. Add the mushrooms, whole onions and peas to the stew. Stir to combine. Return the pot to the oven and cook for about 15 minutes. Remove from the oven and adjust the seasoning. After adding the tomato paste to the vegetable – wine mixture, place the seared beef cubes into the crockpot. Pour the vegetable-wine mixture over the beef and mix well to combine. Add enough broth to cover the beef. Cook on low for 6 hours. 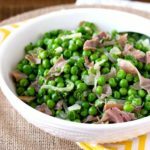 Add the mushrooms, whole onions and peas to the crockpot. Stir to combine and cook on low for 1 hour. 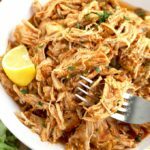 I love “clean the fridge day” recipes AND crock pot meals! Thanks, Kathy! This looks great! Beef stew is so delicious. Add wine and you have a winner dinner. Perfect comfort food. Awesome leftovers. Seriously the prettiest beef stew I have ever seen! This looks so delicious! Awww thank you!!! Much appreciated. This looks so warm and hearty. Perfect for cold, winter days! Hi! I am actually trying this recipe today 🙂 Can’t wait to see how it turns out in the crockpot! 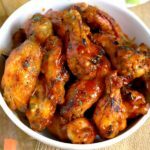 Could you cook this on high?? If so- for how long? Also, when do we put in the bay leaves and thyme in the crockpot version? Thank you! Hi Sue, thank you for your message. On high cook it for 31/2 to 4 hours. Add the bay leaves and thyme at the same time you add the vegetable-wine mixture. Enjoy!!!!! I have made this stew in the crock pot and the stove. Both ways always turn out great! It’s so tasty and the sauce is just delicious. 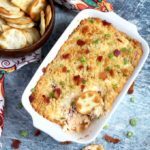 My family loves this meal. Thank you, thank you!! Thanks so much! Glad you like the stew as much as we do. 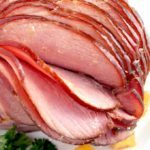 Would I need to adjust anything if I just use a whole 3lb chuck roast?